You are at:Home»Haunt News»Scare Kingdom Scream Park is open 29TH APRIL for 1 SPECIAL Night! Scare Kingdom Scream Park is open 29TH APRIL for 1 SPECIAL Night! 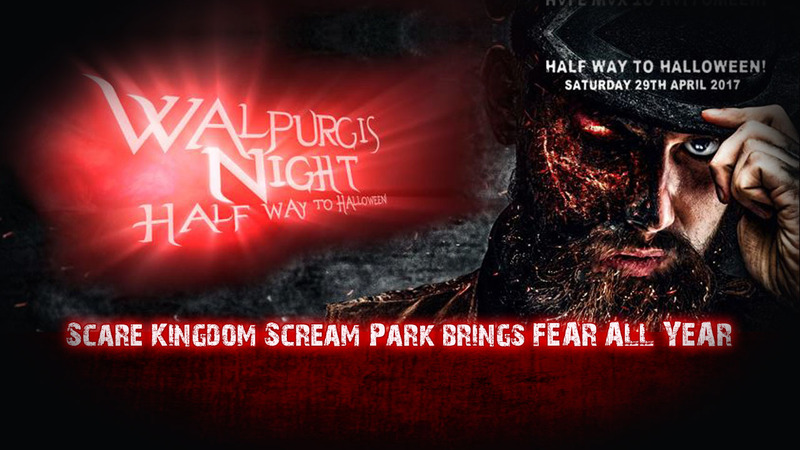 Scare Kingdom Scream Park brings FEAR ALL YEAR with the launch of ‘Walpurgis Night’ on Saturday 29th April 2017, marking exactly ‘halfway to Halloween’. Lancashire’s top rated scare attraction will scream into action this spring season, as the all-new Walpurgis Night – HYDE & Seek scare entertainment experience offers courageous couples, stalwart singles and fear-seeking families a chilling adventure inside the multi-award winning Manormortis haunted attraction. Based on the 17th century Germanic ‘Walpurgisnacht’ festival – the night where sorcerors and witches meet on May Day’s Eve, Scare Kingdom Scream Park’s Walpurgis Night – HYDE & Seek combines live scareactors and special effects in a 15 minute walk-through experience. Celebrate ‘halfway to Halloween’ at Scare Kingdom Scream Park’s brand new Walpurgis Night – HYDE & Seek, and come face to face with the sinister Dr Jekyll and the monstrous Mr Hyde. For those guests aged over 18, Snuffhouse Alone – Bloodborn, will also open its doors, with a new version of the full-contact scare attraction (extra charge applies). Walpurgis Night – HYDE & Seek will open its doors for one night only on Saturday 29th April 2017, from 6.30pm with last entry at 9.30pm. Tickets are £10.00 per body if booked online in advance. A limited number of tickets will be available on the door at £13.00 per body. A licensed bar will be available.